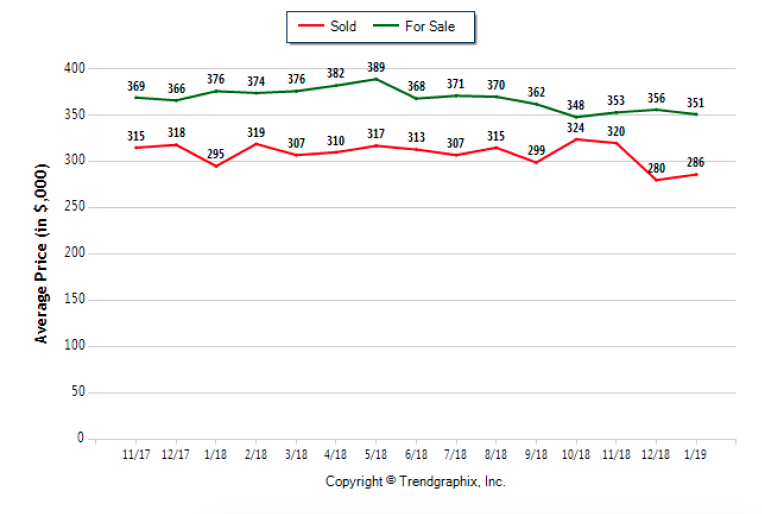 In January 2019, the Wesley Chapel housing market trended neutral. That means neither buyers or sellers had an advantage. In January 2019, the number of single-family homes for sale climbed 34.6% from January 2018 and 9.9% from December 2018. The number of single-family homes sold fell 14% year over year and 25.2% month over month. The number of single-family homes under contract jumped 44.6% compared December of 2018 and held steady compared to January 2018. The Months of Inventory came in at 5.3 months, up 56.6% from January of last year. The Average Sold Price per Square Footage rose 2.4% compared to last month and 3.3% compared to last January. The Median Sold Price dropped 3.8% and the Average Sold Price increased 2.1% from December 2018. 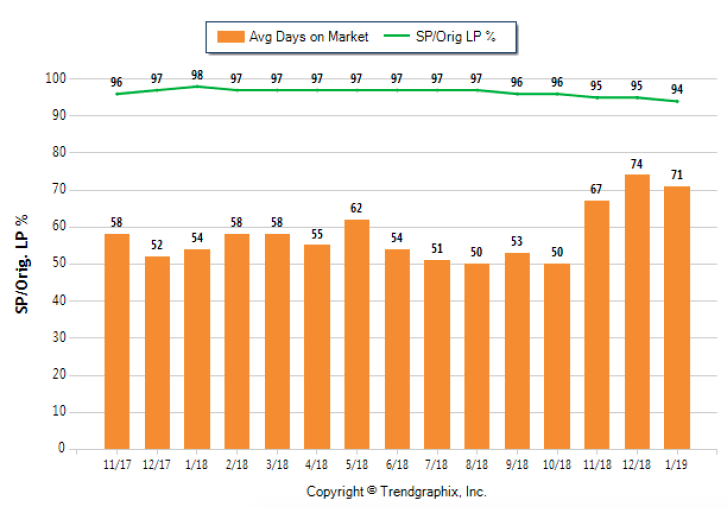 The Average Days on Market showed a neutral trend, increasing 31.5% compared to last January. The ratio of Sold Price vs. Original List Price was 94%, a decrease of 4.1% compared to January 2018. In January 2019, 80 homes sold, a drop of 14% from 93 in January of 2018 and 25.2% from the 107 sales In December 2018. In January 2019, 108 homes were listed for sale. That’s an increase 34.6% from January 2018 and 9.9% from December 2018. 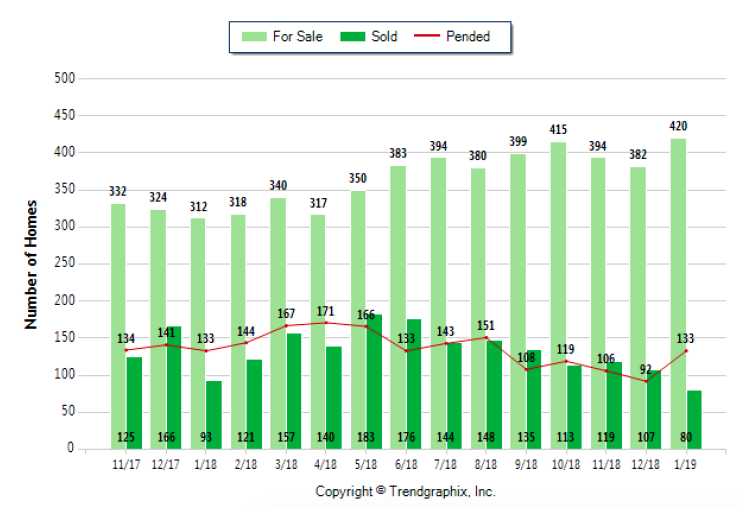 In January 2019, 133 homes were under contract (pending). That’s a 44.6% rise compared to December 2018. It’s the same number as January 2018. The Average Sold Price per Square Footage indicates the direction of homes values. The ‘mix’ of high or low-end properties in the market can sometimes skew the Median Sold Price and Average Sold Price. So the Average Sold Price per Square Footage is a more normalized indicator on the trend of property values. The January 2019 Average Sold Price per Square Footage was $126, up 2.4% from $123 last month and 3.3% from $122 in January of last year. The average Days on Market (DOM) shows how many days the average home is on the market before it sells. An upward trend in DOM indicates a move towards more of a Buyer’s market, a downward trend indicates a move towards more of a Seller’s market. The DOM for January 2019 was 71, down 4.1% from 74 days last month and up 31.5% from 54 days in January of last year. The Sold Price vs. Original List Price reveals the average amount that sellers agree to come down from their original list price. The lower the ratio is below 100% the more of a Buyer’s market exists, a ratio at or above 100% indicates more of a Seller’s market. In January 2019, Sold Price vs. 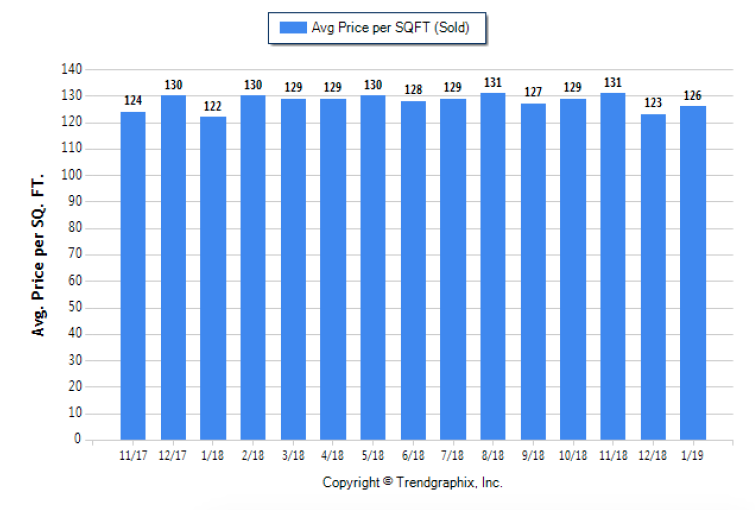 Original List Price was 94%, down 1.1% from December 2018 and 4.1% from January 2018. The Average For Sale Price in January was $351,000, down 6.6% from $376,000 in January of 2018 and down 1.4% from $356,000 in December 2018. The Average Sold Price in January was $286,000, down 3.1% from $295,000 in January of 2018 and up 2.1% from $280,000 last month. The Median Sold Price in January was $250,000, down 15.5% from $296,000 in January of 2018 and down 3.8% from $260,000 last month. 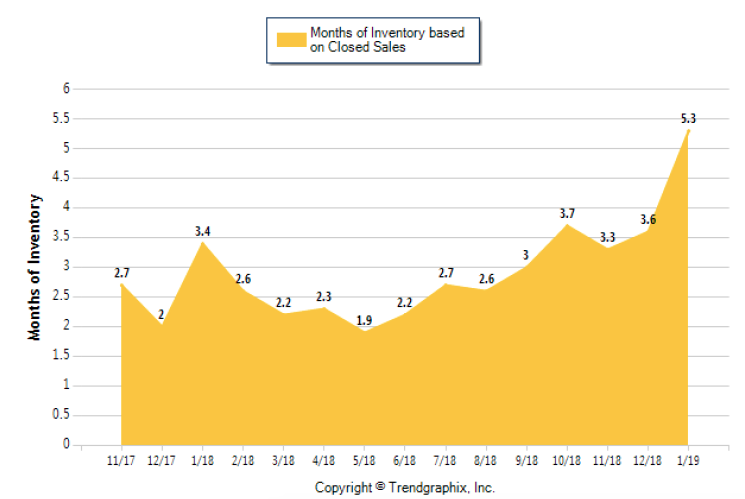 In January 2019, Months of Inventory came in at 5.3 months, an increase of 56.6% compared to last January and 47.6% compared to last month. Absorption Rate measures what percentage of the current active listings are being absorbed each month. 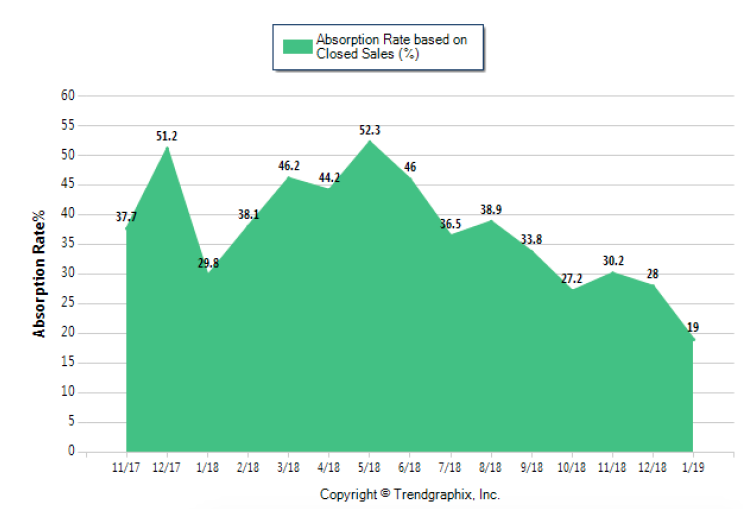 In January 2019, the Absorption Rate of 19 was a drop of 36.2% compared to January 2019 and 32.1% compared to December 2018. Florida State Fair: The fair returns to Tampa’s Florida State Fairgrounds on Thursday for the 115th year with a “Discover the Fun” theme. Highlights include rides, food, exhibits, animals, shopping, rodeos and a candy exhibition. Admission is $11 for adults; $6 for children 6 to 11; and free for children 5 and under. Visit floridastatefair.com for more ticket options. Sant’ Yago Knight Parade: Gasparilla season continues on Saturday when Tampa Mayor Bob Buckhorn serves as grand marshal for this year’s night-time parade along Seventh Ave. in Ybor City, featuring more than 100 illuminated floats, marching bands, krewes and their royalty. Free, $25 bleacher seats. (727) 895-5030. Gulfport Peace, Love and Pride Festival: Gulfport celebrates pride, diversity and everyone with music and a chili cook-off on Sunday. Gulfport Casino, 5500 Shore Blvd. S. Free. (727) 289-9365. Music: Alt-rockers Sevendust play Jannus Live on Tuesday ($24), while alt-hip hop group G. Love and Special Sauce make a stop at Clearwater’s Capitol Theatre on the heels of their 25th anniversary tour ($32.50-$40). Indie-pop phenom Japanese Breakfast returns to Tampa on Saturday with a show at the Orpheum ($20). 111 Years of Broadway: Neil Berg’s production returns to Ruth Eckerd Hall on Monday, with revived arrangements of Broadway classics as well as favorites from newer productions ($18-$35). rutheckerdhall.com. Winston Duke: USF’s lecture series features the Black Panther star, who will discuss his career and how films like Black Panther influence black culture. Takes place in Marshall Student Center on Friday. Free. Madea’s Farewell Play: Tyler Perry plays his most beloved character, the curmudgeonly Mabel “Madea” Simmons, on one more tour before he brings the character to an end. Wednesday-Thursday at Tampa’s Straz Center ($48.75-$$128.75) strazcenter.org. Lady Swanwhite: The world premiere of Anton Coppola’s chamber opera at Tampa’s Straz Center on Saturday will be conducted by Maestro Jorge Parodi. Coppola is the uncle of legendary director Francis Ford, so the event will likely be star-studded ($67-$118). 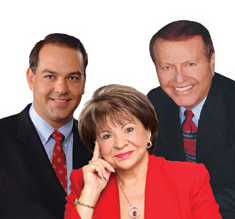 strazcenter.org. Tampa Bay Rays Fan Fest: Get autographs from players ($25) and enjoy a gaming experience at Tropicana Field on Saturday. Fans ages 18 and older must visit raysbaseball.com/fanfest for a free ticket. Hockey Day Tampa Bay: Join Tampa Bay Lightning Alumni and staff at Tampa’s Amalie arena on Sunday for a day all about hockey with an LHSHL All Star game and a fire department vs. police department game ($10). Purchase applications were down this week after soaring early in the year. 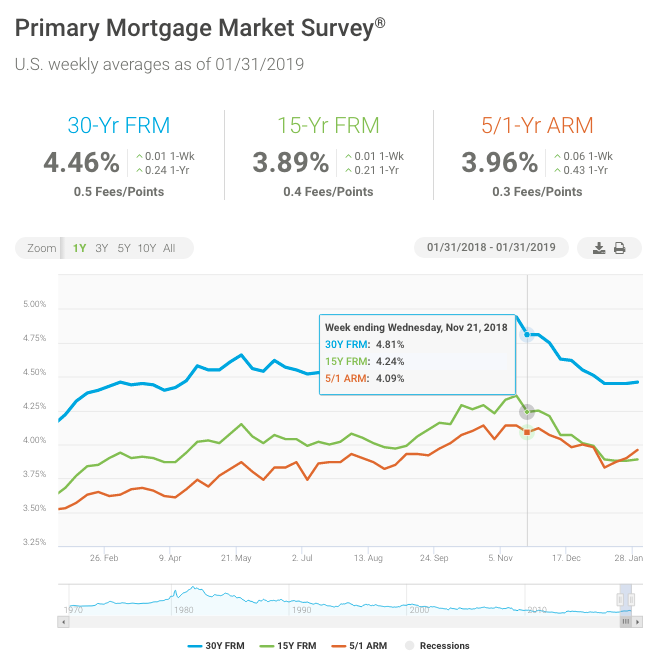 However, softening house price appreciation along with increasing inventory of homes on the market – and historically low mortgage rates – should give a boost to the spring homebuying season.